“…Both you and I are incapable of devoting ourselves to contemporary social significances in our work; Willard [Van Dyke] is gifted in this respect. I come to think of him more as a sociologist than a photographer. His photography seems to be turning into a means to a social end, rather than something in itself. I will regret it if it becomes that entirely, for he is too [sic] good a photographer to submerge it in anything else. I still believe there is a real social significance in a rock – a more important significance therein than in a line of unemployed. For that opinion I am charged with inhumanity, unawareness – I am dead, through, finished, a social liability, one who will be “liquidated” when the “great day” comes. Let it come; I will try to adapt myself. But, (expletive), I refuse to liquidate myself in advance! There’s a lot to unpack in that passage. I would initially disagree with the notion that a rock has equal signifcance to a line of unemployed. However, I think I get the larger context that Adams clearly hoped his work would have relevance well beyond the issues of the day. Thus, it was necessary for him to weather certain criticisms in order to stay true to his personal values. There are more than enough headlines to illustrate my next point, but suffice it to say that there are many, many – many, people – social and humanitarian causes which demand attention on both the global and local front. Each human being – let alone each artist – needs to determine the extent to which they will respond to the world around us, and frame that response around distinct action or inaction. That said, an artist may well take up humanitarian and social causes in ways that are thoroughly utilitarian and not necessarily openly presented to the world for exhibition and commentary. An abstract painter, for example, who never says a word through her art about social issues may well be a prolific Bible teacher, or a tireless community volunteer, quietly contributing to humanity’s immediate causes in her own, offline way. And there is, of course, a time to speak, and a time to be quiet. With that said, should such an artist feel or be viewed as a “social liability” because she does not choose to also align her artistic contributions to the issues of the day? In the case of Ansel Adams, much of his work ended up having a significant impact on long term environmental causes, including legislation intended to protect the vast natural spaces that we know of today as America’s national and state parks, benefits to humanity which extended well beyond the contemporary Depression era images of the “line of unemployed”. This is not to suggest that, A) we should all expect that our work as photographers will earn the Presidential Medal of Freedom and change laws, or B) that our contemporary issues don’t deserve an immediate and zealous response from each of us. What it could suggest, however, is that a self-examination of one’s intentions creatively could expose an impetus one way or another – whether one should indeed use her creative voice to contribute positively to the issues of the day, or to create art for it’s own intrisic value and merit. Should any of us be out making photographs of rocks, beaches or people smiling in the streets when there is so much misery, pain, and lack of understanding in the world today, or should we all take up the cause of photojournalists and focus our talents to speak loud and speak now? There is perhaps no broad brush answer, but indeed – time will tell. 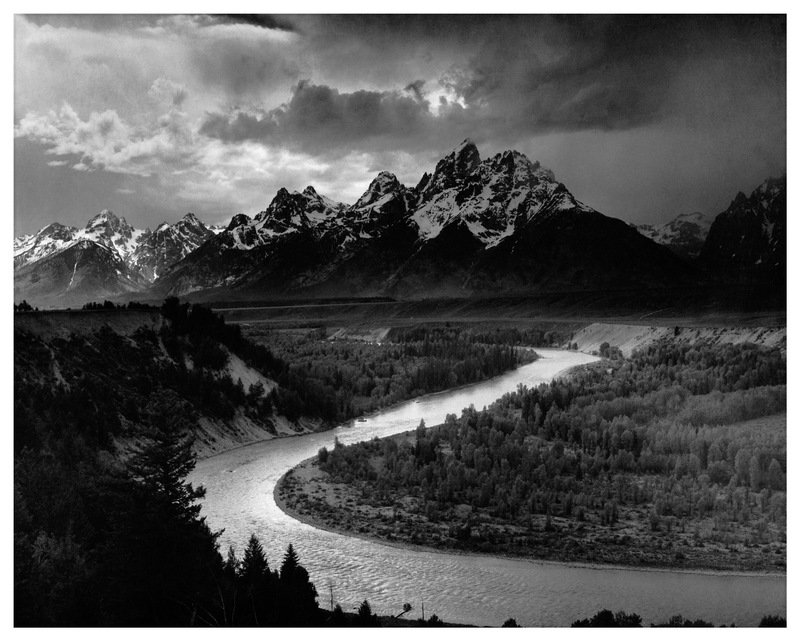 The Tetons and The Snake River, Grand Teton National Park, Wyoming, 1942. By Ansel Adams. Next Next post: The 10,000 Hour Rule: Are We There Yet?